Listed as one of Top 10 Boutique Hotels San Antonio by The Guide To the Good Life. "Affordable Elegance in the Classic Southern Style"
by the San Antonio Hotel and Lodging Association. Our graceful San Antonio TX bed and breakfast neoclassical mansion is conveniently located just down the street from the Fort Sam Houston quadrangle and easily accessible from San Antonio International Airport and downtown by car. This historic San Antonio TX B&B was built from 1906 to 1909 for General John Lapham Bullis, a frontier Indian fighter who played a key role in capturing Geronimo (some claim the Apache chief's spirit still roams the mansion) and beautifully restored in the 1980's. We are proud that our building is a Texas state historic landmark. As a guest of the Bullis House Inn Bed and Breakfast in San Antonio, TX, you will dine on a simple but delicious Continental breakfast of whipped orange juice, pastries, cereal, and coffee, tea or hot cocoa. Your breakfast is served inside the large dining room with its claw-foot oak tables, or perhaps you may prefer to take it outside on the wide veranda to catch the delightful morning breezes. 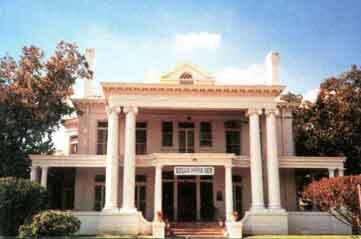 After breakfast, or in the cool of the evening, you may wish to walk past the many historic homes of adjacent Fort Sam Houston, or visit the Historic 1886 Quadrangle where Geronimo was once held captive and where peacocks, deer, rabbits and other animals now graze. During the summer months you may wish to refresh yourself in our crystal clear swimming pool. The Bullis House Inn Bed and Breakfast has been featured in and recommended by: The New York Times, Southern Living, San Antonio Express News, Hill Country Sun, Frommers, Fodors, Let's Go USA and Best Hotel Bargain by San Antonio City Search. Voted one of Best Hill Country Sites. 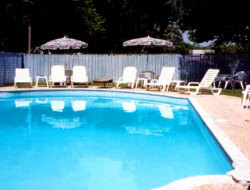 This San Antonio bed and breakfast inn site written, hosted, and maintained by HUEY Productions.